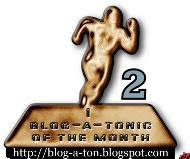 This post garnered second most number of votes from amongst the 75 entries for Blog-a-Ton 13 and won me the Silver Blog-a-Tonic of the Month aka SILVER BATOM award. Click here to see the results page. As he entered the Hyderabad station, he could hear the whistling engine. Realizing that he is losing the time, he started running towards the platform as the train chugged along. Wasting no time, he hopped onto the first wagon within reach, hurting his left forearm which was already bandaged. “Assalamu alaikum,” he greeted the men sitting in the first compartment as he searched for a vacant seat. “Wa alaikum assalam,” replied three of them in a chorus. One of them, a jovial looking person, made space for him on the rugged bench. “Hello, I am Iqbal. That wound seems pretty nasty, brother,” he said looking at his bandaged forearm. “A blow during a riot,” he replied with lack of emotions in his eyes. “If you are the one with just a minor injury, then I believe that kafir must have gone down after inflicting it upon you,” interjected another fellow passenger with a flowing beard. “You bet,” he replied, smiling with an evident sense of pride. “I don’t think there is any need to smile about this senseless violence,” commented Iqbal in a serious tone, unlike his general disposition. “I believe, you were lucky, not to be stuck in any riot then,” said the bearded passenger condescendingly. “I lost my brother to it,” came back Iqbal’s matter-of-factly reply. There was silence for some time before the bearded passenger spoke up once again. “My name is Raza Khan. What’s your name brother?” he inquired the new co-traveller. “I am Shah Mohammad from Multan,” he replied. “Well, I’ve heard there has been considerable rioting up north in Punjab,” said Iqbal inquisitively. “Yes, you have heard it right. As it is, there is little love lost between Hindus, Sikhs and Muslims due to the trust deficit created by all the political activities in the recent past. “Moreover, the partition has been pretty haphazard, Amritsar and Lahore being the bone of contention. All this has led to a lot of inter-communal violence on both sides of the border,” affirmed Shah. “Sindh has been pretty peaceful, unlike Punjab. I see no reason why can’t the existing populations keep staying where they are,” said Iqbal empathically. “What are you saying? Pakistan is the land of Islam. How can kafirs stay here? "As it is, there is such an influx of our Muslim brethren from across the border. Where will they stay if we do not kick out these dogs from here?” answered Khan indignantly. “He’s right,” said another co-passenger as others also nodded along. Shah wiped off his brow and adjusted his bandage, evidently still in pain due to the wound. Seeing the odds against himself, Iqbal preferred to keep to himself while others started discussing the horrific tales of massacres and violence. Suddenly, the hustle and bustle was interrupted as the wagon jerked and the train slowed down near an approaching station. “We all are the sons of the same God. This is His Land and we all have equal right upon it and its resources. May Allah’s mercy be upon you,” said Iqbal, picking up his luggage to deboard the train. “Ah! Thank goodness that weak hearted dog has left this train. If he had stayed anymore, I would have definitely thrown him out of it,” said Khan with raised brow and quivering moustache, as the engine whistled again. “Indeed,” replied Shah in acknowledgement. “So what takes you to Karachi?” asked Khan. “Well, I work for a merchant. I am going to Karachi in relation to some consignment that is reaching the docks tomorrow,” replied Shah after a brief pause. “So, you were part of a riot, haan” commented Khan. “Yes. As you have already noticed, this wound speaks for itself,” replied Shah matter-of-factly. “How many dogs did you slay?” asked Khan continuing with his volley of questions. “Well, a couple of them,” replied Shah, keeping Khan in good humour. “You know why am I going to Karachi?” Khan said, wanting Shah to show some inquisitiveness. Shah just shrugged his shoulders. “Well, my brother worked for the government in Delhi. Upon hearing the news of partition, I sent him a telegram cajoling him to return to Hyderabad as soon as possible. “As he was a government official, he thought unlike other fleeing Muslim brothers, he could take his time in disposing off his property and gathering some resources before he leaves India. “By the time he left for Lahore, violence had reached its peak in Punjab. His train was attacked by the Sikh guerrillas near the Ludhiana station. Despite the Indian army that was accompanying them, he didn’t survive. I am so sure that the army must have conspired with the guerrillas too. “What was his fault? He was just peacefully leaving their land and returning to Pakistan. Now, it comes upon me to avenge his death. “They killed my innocent brother. And you know, now I’ll be killing their fleeing brothers,” concluded Khan, evidently seething within. “Inshallah,” said a couple of co-passengers. “Anyone of you wants to join me in this service of God,” asked Khan looking one by one at all the five men sitting in his compartment. No one seemed to be forthcoming. Sharing tales of violence and condoning such heinous acts was one thing but being a part of it, a totally different thing. “See, I have planned everything. As such there is little scope for violence in the city due to heavy security. “My cousin works at the port who’ll let me through to the ship bound for Bombay. Once it drifts away, I’ll attack the unarmed passengers and before anyone can raise an alarm, I’ll jump overboard and swim back to the shore. “With no witnesses to vouch for it, I’ll be a free man; free from the fire burning within me and free from any potential accusation,” Khan tried to convince others, pulling out a long dagger from his bag. The co-passengers were taken aback and conveyed their unwillingness in hushed tones. Once the train reached the Karachi railway station, both Shah and Khan proceeded to the port. The city seemed pretty crowded due to the migrating population. Khan kept close to Shah to ensure that his just acquired accomplice doesn’t have any second thoughts. “We are well in time; ship leaves in just half an hour,” exclaimed Shah on seeing the schedule hung on the rope at the ports entry. “Just see these dogs boarding the ship. They think, they’ll just move away like this. They don’t even know what is going to strike them,” snickered Khan. “Brother, I’ll need a dagger too. You arrange for our mini-voyage and I’ll meet you there in about ten minutes,” said Shah. “Don’t you worry about that. You hold this,” replied Khan pulling out a sharp knife from it’s holster tucked in his salwar. Shah put it in his satchel and soon the two of them boarded the ship, waiting with bated breaths for their final assault. As the ship hit the Arabian Sea, Shah along with Khan slowly moved to the deck. By now the ship had drifted about a mile from the shore on its way to the Bombay harbour. A crowd was gathered on the deck, emotionally waving goodbye to their homeland. ‘Now is the time’, Shah thought leading Khan to a secluded bulwark on an otherwise crowded deck. Suddenly there was a subdued yell followed by a loud splashing noise. Half a dozen alarmed bystanders turned their heads to see Shah standing there alone against the rail, catching his breath. “What happened?” asked one of them. Shah quickly lifted up the sharp dagger lying at his feet and with one quick manoeuvre, ripped open his bandage, before throwing the dagger overboard. “What’s going on?” said another curious onlooker before seeing Shah's scratchless forearm where there had been a bandage just moments ago. “And what kind of wound did you have? It seems to have completely healed or should I say vanished,” he added ponderously. Tilting his forearm, Shah grinned at his own ingenuity. The baffled bystander looked at the name tattoo on his left forearm before giving a puzzled smile to the smiling Shah Mohammad. I know the twists in my stories can be tricky at times. So explaining the plot. Sham Mohan is a Hindu fleeing Pakistan during the partition. In those days, many people usually tattooed their names on their forearms. If caught, Sham could be killed by people like Khan. So he applied a bandage to conceal his identity. This part of the story is based on my grandfather's escape from Pakistan. This work of fiction has been adapted from a 66-Fiction, I wrote last year - The Journey of His Lifetime. If you liked this short story, you can click here to promote it on Indivine. all the best for BAT, Marshy.. Very provocative and strong emotions displayed here, especially that of revenge. The twists and turns taken at the end were very interesting and made it exceptionally good. I just kept reading, wondering where it was leading, nice. Wish u luck for the competition. Interesting!! I was surprised with the way it ended :) All the best! Interesting read. But I am a little skeptic on the ending. Why did he have to pay back in the same coin. No doubt, he saved numerous lives, but he could have stopped him in other ways too. And why was he spying on them by concealing his identity? Does it show a provoked youth? Incredible twist at the very end. A wonderfully narrated story in the backdrop of the Hindu-Muslim riots! It was an Intense story with raw emotions. What an intelligent post. Unfortunately I havent read the prequel of this one you mentioned..but this story itself madea good read. Didnt feel like I missed out on much..
Wow! That was intense. The twist in the end was neat. I always find it very challenging to imagine or transport oneself into a timezone that we know only through history and fiction. @Anonymous Someone.. Hey, thnx for bringing up ur skepticism.. lemme explain.. I've left the ending open for interpretation.. thr was a subdued yell and a splash.. Shah could have stabbed Khan or just taken him by surprise, overpowered him and thrown him overboard. Remember, Khan knew how to swim, so he could swim back to shore..
Now, coming to your second doubt.. It turns out tht u didnt gt the plot.. Shah or should I say shashi, was not spying but escaping from Pakistan.. He was wearing that bandage to conceal his identity as a Hindu. @Samadrita.. Hi, frst of all welcome to BAT and to this blog..
@Vibhuti.. Hey, its not a sequel but an adaptation from tht 66-Fiction.. FAntastic narration and the twist at the end! Hey thanx Vignesh.. Welcome to BAT..
vipul, one thing that you never fail at is to end the story in a way that no1 cud expect...wonderfully written.. Your scene constructs are very vivid.They capture the mood of the moment quite well .I for one,liked this entry better than your previous one. Good job. Thats was a wonderful work of fiction really ..and apart from that I have learned few synonyms too ..
Great piece of work .. Though the contents seemed to be familiar the dialogue was engrossing. You did manage to keep Shashi Mohan off the scene long enough for the reader to somewhat forget him. Very well done Vipul. Story, Narration and the suspense was crisp and clear. Great thoughts indeed and very well narrated..
and vote if you wish.. In the beginning i felt as if I was watching some movie like Bombay...latter felt the aura of 1857 and latter 1947... That was a true movie for me to see and feel! To every line or para there was somthing new to discover and I liked that surprise factor though a sad post with strong emotions! it makes me sad to read the post...partition was a sorry affair for many families on both sides of the border..
Vipul,good to see you here after a long time with such a touching post. @Tweety.. yup it was sad indeed.. still yearn to c the land of my forefathrs, it feels as if my roots have been severed..
Vipul i am in a fix...what do i write what these guys havent?...the story was nice, well constructed for sure...the ending was amusing and a nice twist ...gr8 yaar!! though some words i cant understand! all the best for BAT 13! its true tht is the most important event in indian history impacting nearly every life! Haila! Kahaani mein twist! Not for one single moment did I suspect that there is going to be some bouncer at some point in the story considering the way it sailed. Smooth. But a bouncer it is, in the end! I absolutely loved it! Narration is flawless, characters interesting and the plot,super! @ vipul _ thanks! will wait to see ur comments on my post. the post was intense and deep dude. Writing it on the backdrop of events made it even marvelous read. Kudos. unique take indeed and very topical considering independence day round the corner! That was pretty good. I enjoyed the read. The little twist in the story at the end made it better. What an excellent piece of writing! The twist in the end was anticipated...not that you gave any of it away but it's just how my mind works as well. I was glued from start to the finish! Thumbs up Vipul. You can weave magic through your words and hold people enthralled...tied down to the end. Another twist in the tail! Good one! Nice one, Vipul. Good twist at the end. You must read Khushwant Singh's 'Train To Pakistan' sometime, if you haven't already.